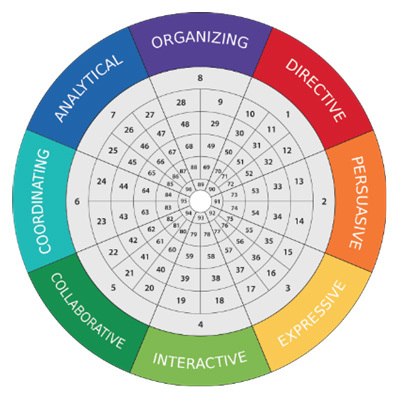 This tool provides information on an individual behaviour patterns, skills, psychological types and motivations. Because of the accuracy of its analysis, this tool constitutes both a strong personal and professional development tool. The NOVA Profile synthesises three of the most striking studies on human behaviour patterns: the « DISC » theory by William Moulton MARSTON (related to the language of colours), Carl Gustav JUNG’S psychological types, and Eduard SPRANGER’s work on motivations. The NOVA Profile™ also demonstrates the « Natural Style » of a person, independently of their surroundings, and their « Adapted Style » in response to the environment. These two styles allow for a better understanding of an individual’s perceptions and response to their environment. The results can be completed by a specific skills’ evaluation in communication, management and personal development, amongst others, depending on the nature of the intervention with the respondent. How and why is a person doing things, approaching problems and challenges, dealing with change, collecting information, making decisions… What is their communication style, management style, leadership style, selling style… What are their contribution in the team, dominant perceptions, behavioural preferences. Personal, Management, Sales, Training, Team, Candidate and Comparison (job comparison).